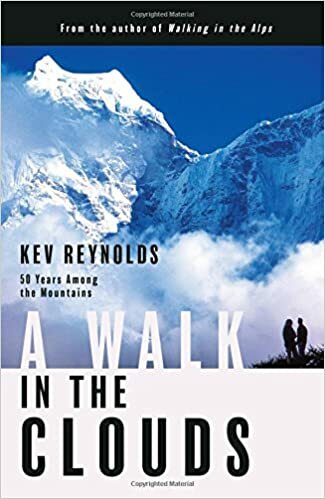 A Walk in the Clouds: 50 Years Among the Mountains is a heartwarming, inspirational, and evocative collection of memories and short stories from Kev Reynolds, a prolific and celebrated guidebook author who has been roaming the mountains for a half-century. These recollections trail Reyonlds' journeys through some of his favorite and most memorable lessons learned on the mountains. The people met, experiences shared, and cultures bridged throughout Reynolds' travels make for an engaging read for hikers and non-hikers alike. Shadowing Reynolds across the Moroccan Atlas, the Pyrenees trails, the European Alps, and even the Himalayas gives the reader the feeling not only of hiking the trails, but also of forming the relationships and connections throughout the world that Reynolds was able to create. This book motivates the common reader to undertake something they have never done before because, as the reader learns from Reynolds, that is where some of the best experiences come from.